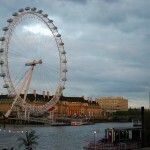 This summer I am working in London for PRTM Management Consultants. 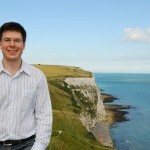 I pursued this opportunity to build on my international business experience and gain some exposure to European culture. Also, the timing worked out well for my wife, who teaches high school in Charlottesville and was able to join me in London for the summer. My first project was based in South Africa and lasted about one month. 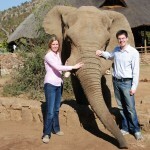 Since my wife arrived in London the day I left for South Africa, we arranged for her to travel with me for the first part of the project (see photo with elephant above). While she was touring South Africa, I was working with my project team to support the formation of an international joint venture. Specifically, my role was to perform an operational capabilities assessment of a South African company. Having completed similar projects with PRTM as a pre-MBA associate, it is clear to me that the first year Darden program did a great job of preparing me for this project. In particular, the following capabilities that I developed over the last 8 months at Darden significantly improved my effectiveness on this project. Communication skills – for this project I participated in dozens of executive level meetings. The case method of teaching was good preparation for these meetings and during the first year program I participated in around 300 case discussions. These discussions were in many ways similar to executive meetings as both environments require that I make clear, concise, and helpful points at the appropriate time. Broadened business background – the general management curriculum at Darden provided me with a broad background in understanding businesses. This proved extremely useful for a capabilities assessment project, where the real work is not in determining the company’s capabilities but in determining the level of capabilities required for success in the context of the specific business and industry. This is another area where the case method was very helpful; instead of diving into the derivation of particular formula (e.g., Little’s law), we broadened our understanding of business situations and industries by reading case after case during the first year. Technical competence – being able to drill into the technical details of a business situation was another important skill for this project. In several instances I identified the relevant inputs of a specific business formula (e.g., inventory optimization) in the context of this particular company. Then, during interviews I would assess the company’s capabilities for managing these inputs. Darden helped me develop this technical competency by introducing concepts in technical notes, providing an environment to practice these concepts (learning team), and then reviewing these concepts during classroom discussion. Increased confidence – the Darden program increased my confidence in assessing and managing business situations. Because of this increased confidence I pushed others a little harder then I would have otherwise, and ended up generating better results for our team. I attribute this increased confidence to the rigorous first year program coupled with the support provided by the Darden faculty and staff, my classmates, and my learning team.